Luang Phor Suk was born in 1847 (BE 2390) in the northern part of Chai Nat province. In the reign of His Majesty King Rama IV. He ordained as a Monk at the age of 20. Luang Phor Suk studied Dhamma and Samadhi at Wat Pho Thong Lang. He met many guru masters during his travel in Tudong and he learned Wicha from them. 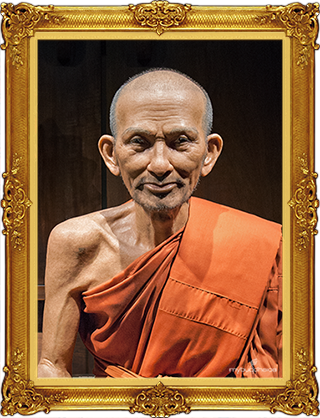 One of the guru masters who taught him Wicha was Achan Thum Wua Daeng. Achan Thum Wua Daeng is also the teacher who has ever taught Luang Phor Ngern of Wat Bang Khlan in Pichit province. Luang Phor Suk was revered as having great spiritual power and was the royal teacher of H.R.H. Krom Luang Chumporn Khet Udomsak, who was the son of His Majesty King Rama IV. One of his abilities is his power and magic to change any objects into different sizes. He has never taught anyone, except Krom Luang Chumporn Khet Udomsak. Until today nobody know about this skill. He passed away in 1917 (BE 2460) at age of 70.